Hawaii ACE Round it up! 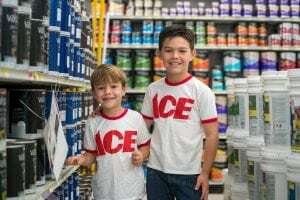 – Ace Hardware Corp.
Hawaii ACE Round it up! Your change could change a child’s life! Round Up your total and donate your change at participating Ace Hardware Retailers during the month of April to support kids like Kapono and Duke being treated at Kapiolani! Ace Hardware has been a proud partner of Kapiolani Children’s Miracle Network since 1991, supporting pediatric programs like Child Life, Critical Care Transport, research and education. ACE Locations in the Hawaiian Islands have raised $8184 in the first week of thier Round-up campaign.